The pilot tube auger boring method can install steel casings with an accuracy that conventional auger boring is not capable of achieving. 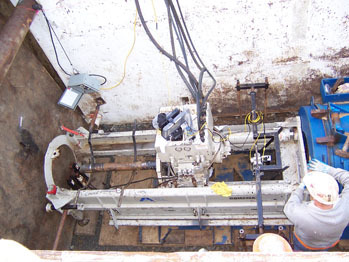 This method is used in conjunction with a specially designed theodolite guidance system to provide accurate pipe installation. Installation is achieved through video monitor surveillance of an illuminated target inside the lead tube. Pilot tube steering is accomplished by aligning an angled steering head to the desired course and thrusting forward. 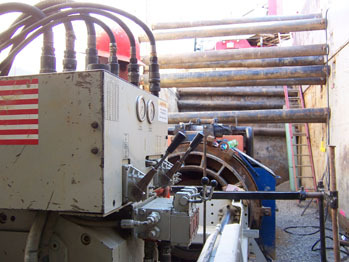 After the steering head has reached the receiving shaft, a reaming head is connected to the tubes, and the lead casing is attached to the reaming head. 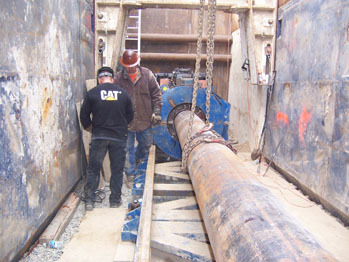 The auger machine is connected and the tubes and casing are advanced. 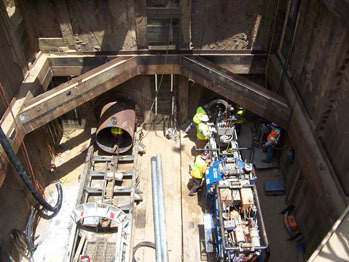 As the casing moves forward, the tubes are pushed into the receiving pit and removed.